Is it possible to have a mermaid job or mermaid career living as a real life mermaid? Is it possible to have a job or career living as a Real Life Mermaid? When MELISSA DAWN, transforms into Mermaid Melissa, she will take your breath away. “My best-known performances have been not just as a mermaid but also as a professional free diver, killer whale trainer and dolphin trainer’’ at Sea World Orlando. Melissa, who grew up in St. Augustine but now lives in Orlando, still performs as a pearl diver at Sea World a couple of days a week. To lure aquarium visitors, try a mermaid! Melissa Dawn is an Orlando, Fla.-based performer who can hold her breath for more than four minutes while she performs a synchronized swimming routine in a shark tank. She’s a former actress and model who markets her services at www.hireamermaid.com. 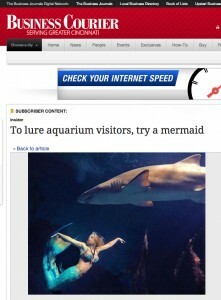 She was a crowd favorite at Ripley’s Aquarium in Myrtle Beach, S.C., two summers ago. After hiring Mermaid Melissa for the 2011 summer season, Ripley’s expanded its mermaid shows to Gatlinburg, Tenn., and Toronto. It has a mermaid training camp to staff its growing enterprise. Mermaid shows are hardly new. Weeki Wachee Springs State Park in Florida has featured mermaids since the 1940s, said Tim O’Brien, a Ripley’s vice president who took the act to Myrtle Beach in 2008. That’s why he sought Mermaid Melissa, a former Sea World trainer whose YouTube videos have drawn nearly 11.8 million views. We tried to reach Melissa, but only traded messages.